Name: Fumiko Kirihara. Student Artist (University of Tsukuba Master’s Program in Art and Design Plastic Arts and Mixed Media.). Address: 2-9-10-401, Sarue, Koto-ku, Tokyo,Japan. 1995/ CHAOSMOS exhibit (Oregon Moon Gallery, Tokyo) CHAOSMOS experiment, looking at non-linear phenomena with a simple experimental device. Abstract: I express the image as a symbol that I have created out of blue water as "Katachi emerging from the ocean -WATER SYMBOL" in this work. The natural phenomenon called "viscous finger" as a motif. Being aware of the katachi as a symbol of a life and the natural rhythm, we can approach the unconscious world primitive people knew. Every human's soul will be healed in a true meaning when connected with such once rooted world. Perhaps this awareness will help us modern-day people, living in cities with our closed but divided egos, to rediscovers consciousness as one member of the universe, rooted firmly to the earth. Blue has always welled up from the bottom of my heart about the theme "Katachi emerging from the Ocean". From the world of the blue, a katachi flows. "The blue world" is the planet of water, i.e., earth, which appears on the universe. And it is blue sea that wraps the earth. I would like to express the katachi as the moment that a life rises from the bottom of deep blue chaos like the sea. Many natural phenomena occur synchronically, and generate form. Then, a life is born. katachi is closely related to the birth of a life. Moreover, man’s creative process resembles the generation of such form. Creation comes up from the bottom of my heart like the sea. Katachi appears in a lot of accidental things and order like a mandala from a chaotic state. Creative katachi is like a miracle which has the power to move people. Creation is the most honorable work of human beings and their processes have been continuously followed up to now. We can be aware of such things, for example, from the Jomon era in ancient Japan. People of the Jomon era knew the katachi which unites model and spirit. There were processes of such creation in the katachi made by people of the Jomon era. The process may be common to human beings or a life object. I would like to express the image with which a symbol will appear out of blue water by "Katachi emerging from the ocean -WATER SYMBOL" in this international symmetry meeting in 2001. Being aware of the katachi as a symbol of a life and the natural rhythm, it can be imagined that we approach the unconscious world primitive people had. Every human's soul will be healed in a true meaning, when connected with such world. It will bring the new consciousness as a member of the universe, which crawled on the root firmly on the earth, to the present-age people who live in a city and cannot help but having closed and divided ego. Moreover, it is supposed that the katachi as a symbol of a life has a possibility as communicating media exceeding the language between different species other than man. In this work Nonlinear phenomena or nonlinear KATACHI are used to express synchronic natural rhythms. The katachi here contains not only a visual form but also an auditors form sense of hearing such as a whale call or echolocations of dolphins. If the meaning of - katachi is investigated, it is defined as "the state of a thing perceived by the five senses" first, and, subsequently, "the external appearance", "a fixed form" etc. The use of expression "the five senses" shows that KATACHI is profoundly related to the senses. In addition, the nonlinear phenomena are the natural phenomena that substances form spontaneously and occur synchronously at random places in nature. To take familiar example, it occurs in human's brain. Moreover it is the phenomenon currently dynamically started also between sea surfaces. The nonlinear phenomenon appear of cyclically and are substance, the source of global activity. The natural phenomenon known as "viscous finger" is utilized in this work. The natural phenomenon "viscous finger" is also nonlinear one. It is the phenomenon that occurs when air is blown into an oil film put thinly between two sheets. The air pushes away the oil film to right-and-left symmetry like a finger. 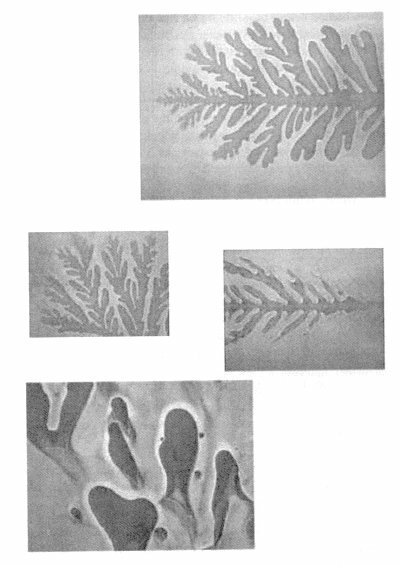 The "Viscous finger" is interesting because the finger dendrite bubbles have various symmetrical shapes which depend on the velocity of the bubble, that is, the relative pressure of the blown air to the oil. The dendrite air bubbles reveals actually the different pattern whenever it is blown. It reminds us of the "KOKOTU" literature in ancient China. Unless you have the correct mind set and you blow air with care, you cannot obtain a beautiful symmetrical pattern. The form is changes freely and also seems like a living thing is born. Moreover, the beautiful form of symmetry will provide an opportunity to tune and ease our mind and to delve into ourselves. I realize the natural phenomenon that makes such a symmetrical pattern, in a wide meaning, as one of the processes which shift from a certain unstable state to a new stable state (equilibrium). It is being wished to realize that there is some shift process, not only the phenomenon that suited at "man's time" such as "viscous finger" and snowy crystal but also the phenomenon leading to the well-balanced state in various time levels on the earth. For example, considered in "time of the earth", it is one of the processes having continued maintaining balance that till present steam condensing, making the sea, cherishing a living thing, bearing man, and having allowed the civilization and social activity after the earth is born. However, it must be aware of the thing that we are approaching to the state which the earth now cannot maintain the balance because of the excess production and the natural destruction based on the idea of a human, any longer. I hope strongly that knowing well about the world of natural "symmetry" leads to understand and solves an earth-environment problem.